I always hear people mention in a bored way "another sushi place opened up" but that cannot be said about Jellyfish. It's a new sushi place. It's authentic. And good. You'll find it on Rush Street with an entrance leading to the second floor (accessible by elevator or stairs) across from Hugo's. The look is very contemporary with a vibrantly lit bar and amazing views of the bustling neighborhood. I was invited to stop in to try Chef Jason Im's menu and was seated in a very comfortable booth while I enjoyed a Kumquat Manhattan from the bar- if you like your whiskey like I do, you'll like this citrusy sweet twist on the classic cocktail. 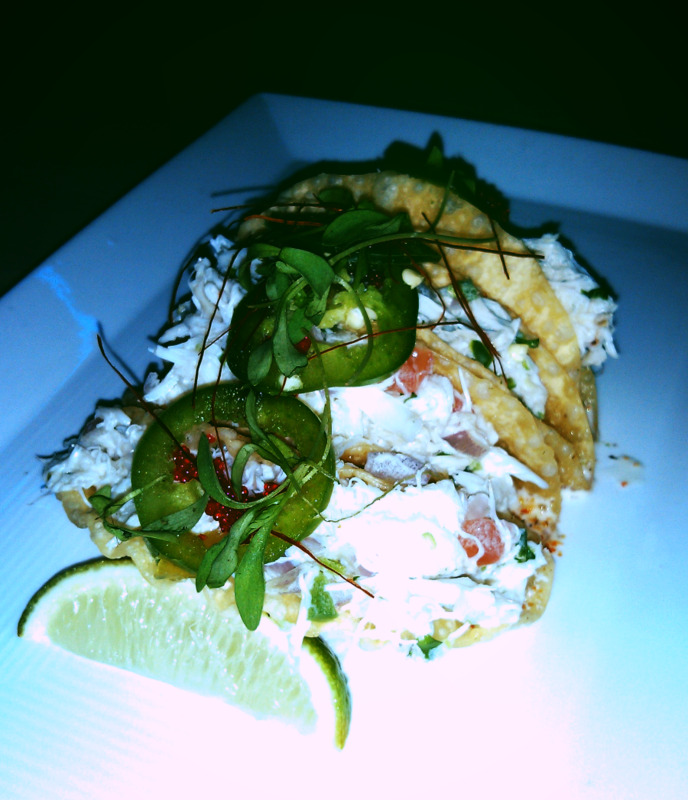 The food started to roll in with Spicy Crab Mini Tacos which are loaded with fresh lump crab, flavored with lime, cilantro and candied lemon. They also have a light kick with red tobiko and jalapeno. This dish is a winner. I also liked their Seafood Ceviche, a mix of scallops and shrimp with a touch of hot sauce and citrus. Another tasty and refreshing way to start off. Another starter followed- the Siam Shrimp. Jumbo black tiger shrimp with pineapple and mixed vegetables in coconut curry. The shrimp are enormous, but I would've liked more curry spice in this though. The rolls are definitely a must as they have some really inventive creations like the Fire & Sol (salmon, spicy ponzu, snow crab), Cherry Blossom (tempura lobster tail) and Summer Rush (tuna, salmon, crab, shrimp wrapped in cucumber) along with classics like California and Spider. The main dishes sound great with selections of Yakitori Chicken and Wagyu Beef Burger, but we tried the Roasted Sea Bass. This dish is just succulent with buttery bass cooked medium and melting in your mouth and salty crisp skin. It was cooked perfectly. Throughout dinner I had my chance to sample the beverage list and tried JC Pichot Vouvray Chenin Blanc and Decoy Cabernet Sauvignon. The choices aren't numerous but they have a good bit of variety like Graham Beck Sparkling Rose, Do Ferreiro Albarino and Ceretto Barolo, along with some heavy hitters like '03 Dom Perignon, Far Niente Chardonnay, and Opus One. Plus the Japanese Whisky and Sake lists are quite solid. Finishing it off, dessert worth the trip as we tried the strawberry panna cotta. It's presented in a mason jar with layers of crunchiness, smoothness, creaminess and fruitiness. Just stick the fork down to the bottom, pull it out and enjoy. And they have an espresso machine, which always makes me happy and is a must for every restaurant in my opinion. If you're up this way shopping and living it up, put this fresh place on your list.